Marco Simons is a contributor to Writers on the Range, the opinion service of High Country News. He is general counsel at EarthRights International, a nonprofit environmental law firm that is providing legal support for this lawsuit. This April, a town and two Colorado counties sued two fossil fuel companies on the grounds that the companies need to help pay the costs of climate change. Boulder County, San Miguel County and the city of Boulder are not seeking to halt oil production, and they are not looking to lay all the costs of climate change at the feet of those two companies. All they ask is that those companies pay their fair share toward remedying a problem that the companies knew existed, and which they helped create. 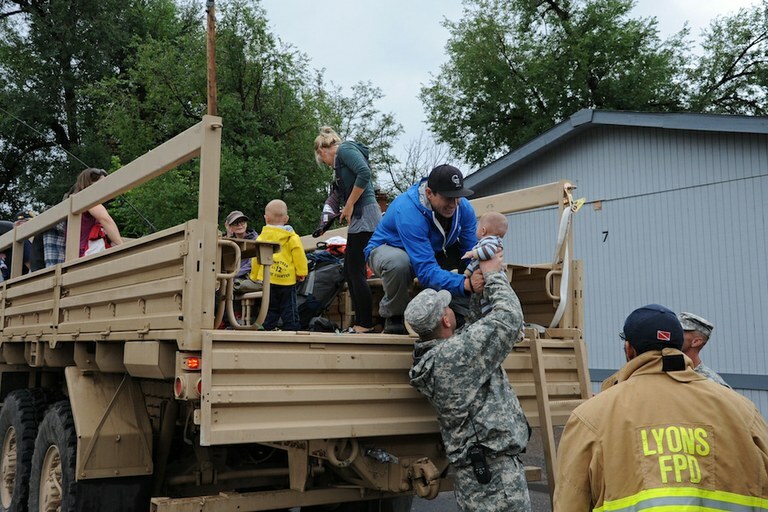 Colorado National Guardsmen and Boulder County authorities help evacuate residents of Lyons, Colorado, during severe flooding in September 2013. Extreme weather events will likely become more common in the coming decades thanks to climate change. Here’s why the decision to sue makes sense. The oil companies in question — Exxon Mobil and Suncor — have long known about the harm that fossil fuel use causes. As far back as 1968, the American Petroleum Institute — the industry’s largest trade association, of which Exxon is a member — received a report warning that, due to carbon dioxide emissions from fossil fuels, “significant temperature changes are almost certain to occur by the year 2000 and these could bring about climatic changes,” and that there was “no doubt that the potential damage to our environment could be severe.” Further internal reports throughout the 1970s reinforced these concerns. Unfortunately, these companies chose to disregard that knowledge in order to continue profiting from fossil fuels. Exactly like the tobacco industry, they participated in disinformation campaigns to spread doubt about climate change and discredit the scientists who they knew were telling the truth. They also funded campaigns to oppose international efforts to address climate change. Exxon and Suncor have now admitted that climate change is real and that their own activities are a major contributor to the problem. Indeed, the Intergovernmental Panel on Climate Change confirms that fossil fuel use accounted for nearly 80 percent of the increase in greenhouse gas emissions between 1970 and 2010. Exxon and Suncor are two of the world’s most substantial contributors to climate change. Yet both companies plan to increase their fossil fuel production, all while sticking communities like Boulder, Colorado, with the bill for the cleanup. A report done for Boulder County, for example, estimated that its climate change costs will reach at least $100 million dollars over the next few decades. The altered climate brought about by unchecked fossil fuel use has severe consequences for all of Colorado, as in the coming decades wildfires and droughts are expected to become more severe, air quality will diminish, water will become scarcer, and extreme weather events will become more common. 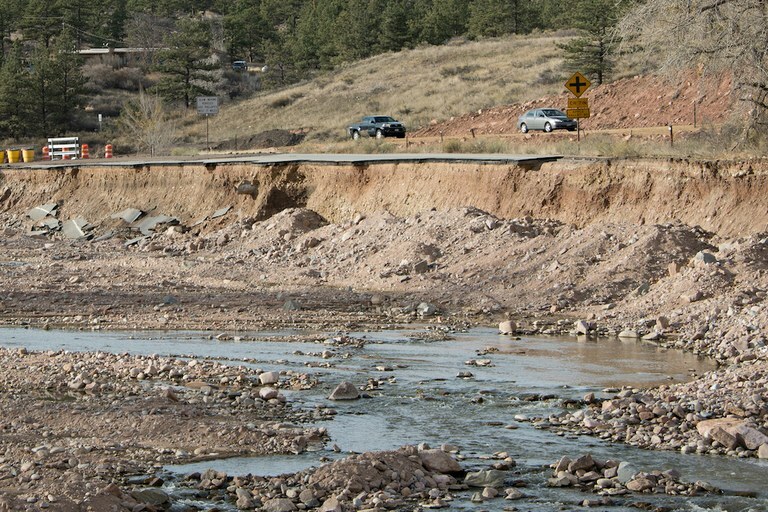 In November 2013, costly damage caused by the flooding that ripped through Boulder County, Colorado, two months earlier was still visible. Communities can take measures to reduce their vulnerability to climate impacts. They can protect against flooding, and they can expand wildfire buffer zones. They can help farmers to find new crops that are more resilient to heat waves, drought and pests. In fact, Exxon itself has taken measures to prepare for climate change, such as adapting its own offshore facilities to protect against sea-level rise. It’s only fair that Exxon should share the costs when Colorado communities have to take similar measures. Even if these communities were to reduce their own carbon footprint to zero, climate impacts are still inevitable. Dangerous levels of greenhouse gases are already trapped in the atmosphere. The costs to local taxpayers are mounting. At its core, these communities’ lawsuit against Exxon and Suncor raises questions of fairness. The communities themselves encourage the use of renewable energy, but the fossil fuel industry has acted, and is acting, recklessly. Now, the three communities are asking for a jury to weigh the evidence and determine the extent to which the companies are responsible. We are confident that the courts will allow a Colorado jury to decide how much Exxon and Suncor should pay for the climate impacts that are now affecting Colorado’s counties and towns.